DFT2 cells express β2m in vitro. 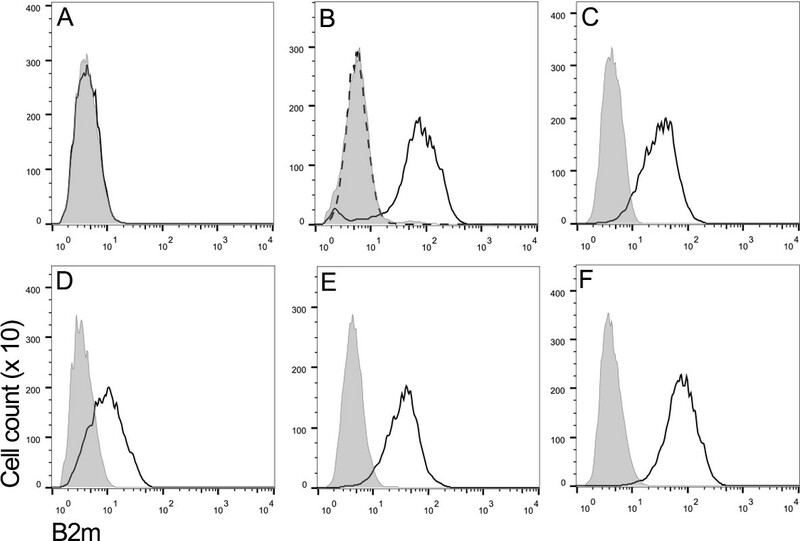 Flow cytometry to compare β2m expression shows (A) DFT1_4906, (B) DFT1_4906 + IFNγ, (C) DFT2_RV, (D) DFT2_SN, (E) DFT2_TD549 and (F) Fibroblast_Salem cells stained with α-β2m (solid line) and secondary only control (shaded peak). DFT1_4906 + IFNγ (B) stained with blocked α-β2m antibody is also shown (dashed line). Fluorescence intensity for α-β2m on x-axis and cell counts on y-axis. 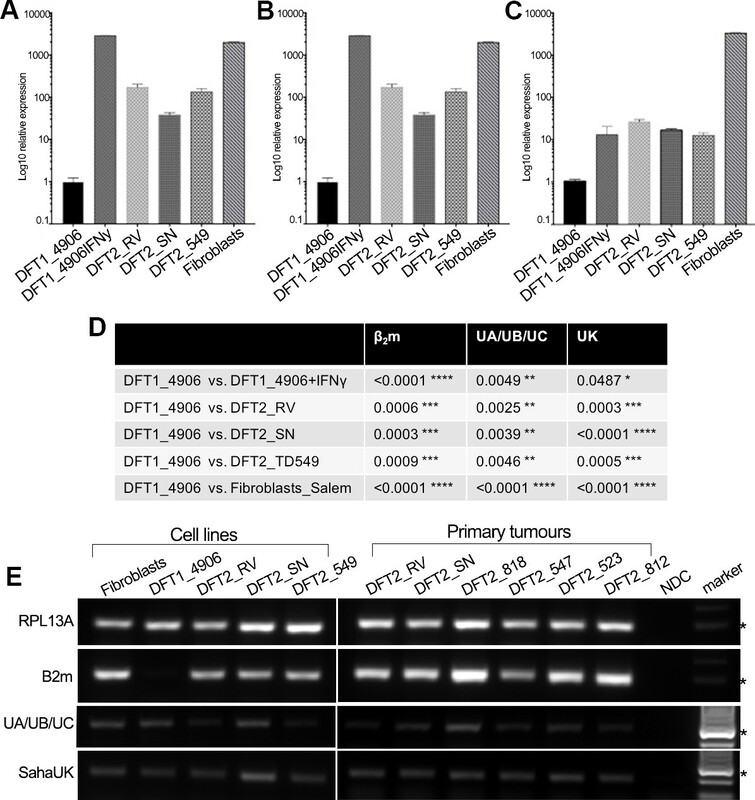 DFT2 cells in vitro and in vivo express mRNA for β2m, Saha-UK, Saha-UA, UB and UC. RT-qPCR of (A) β2m, (B) Saha-UA, -UB and -UC and (C) Saha-UK mRNA expression by DFT2 cell lines (DFT2_RV, DFT2_SN, DFT2_TD549), fibroblast cells (Fibroblasts_Salem) and DFT1 cells treated with IFNγ (DFT1_4906 + IFNγ) relative to DFT1_4906 cells. Gene expression levels are normalized against RPL13A as a housekeeping gene. Data are represented as mean ± S.E.M of three technical replicates. (D) An unpaired T-test was performed to test for statistical significance. (E) RT-PCR on DFT2 cell lines and DFT2 primary tumours for β2m, Saha-UA, -UB and -UC and Saha-UK. RPL13A was used as a loading control. A no DNA control (NDC) is included for each RT-PCR. A marker at 300 base pairs is indicated by an asterisk. RT-PCR amplification of RPL13A and Saha-UD from DFT1, DFT2 and Fibroblast cells. mRNA from DFT1_4906, DFT1_4906 + IFNγ, DFT2_RV-CL, DFT2_SN-CL, DFT2_TD549-CL and Fibroblast_Salem cell lines was used. A no cDNA negative control was included in each experiment. 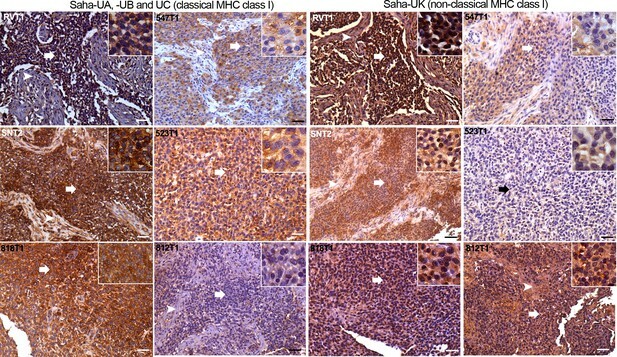 DFT2 tumours express variable levels of classical MHC class I (Saha-UA, -UB and -UC) and non-classical MHC class I (Saha-UK) in vivo. 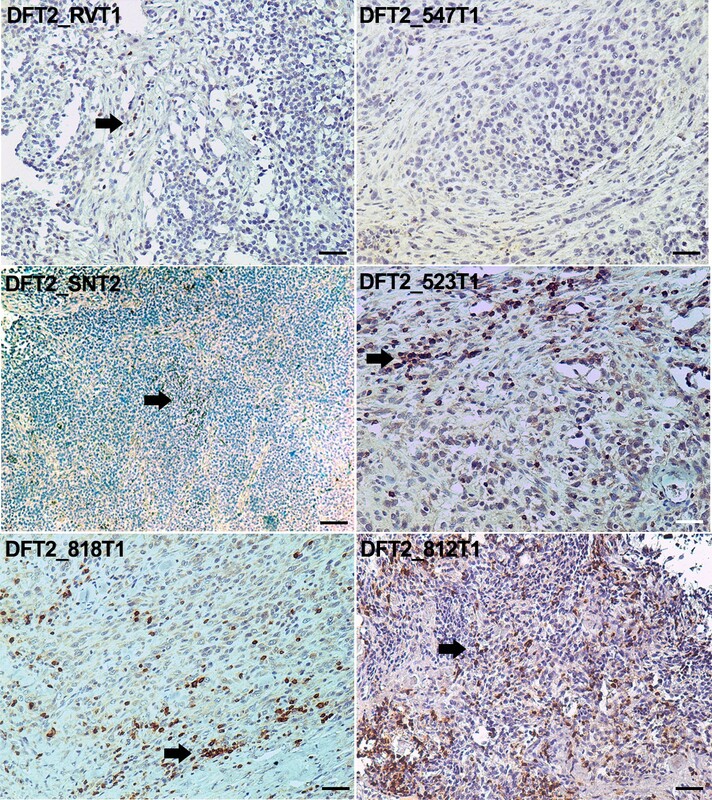 IHC staining of DFT2 tumours (DFT2_RVT1, DFT2_SNT2, DFT2_818T1, DFT2_547T1, DFT2_523 DFT2_812) with α-UA/UB/UC_15-25-18 against Saha-UA, -UB and -UC and α-UK_15-29-1 against Saha-UK. Arrows indicate tumour cells for each biopsy; arrow heads indicate stroma separating nests of tumour cells where present. Isotype and secondary antibody controls can be found in Figure 3—figure supplement 2. Boxed insets are at 600 x magnification and are taken from areas indicated by arrows. Scale bars represent 50 μm. Positive cells for each marker are stained brown, nuclei are stained blue. Nucleotide sequences for the pET22B + SahaUC and pET22B + SahaUK constructs used to test the specificity of the MHC class I antibodies (a- UA/UB/UC 15-25-18 and a- UK 15-29-1) described in Figure 3. Western blots illustrating specificity of the MHC class I heavy-chain monoclonal antibodies. 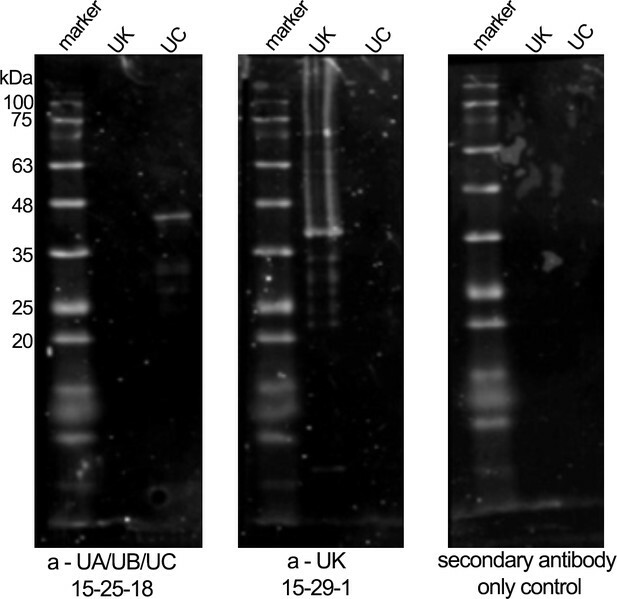 Western blot on classical MHC class I protein (Saha-UC) (38 kDa) and non-classical MHC class I protein (Saha-UK) (39 kDa) with MHC class I heavy-chain specific antibodies. 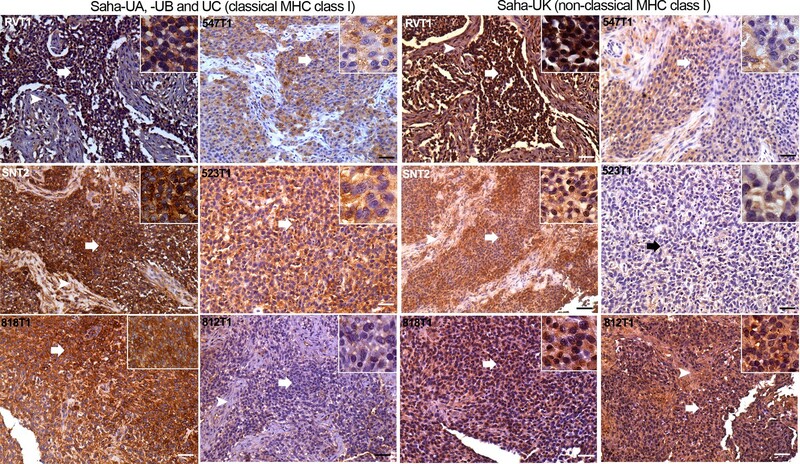 Isotype controls (IgG1b – anti-SahaUA/UB/UC and IgG2b – anti-SahaUK) and secondary antibody only controls for the immunohistochemistry presented in Figure 3. All images are 100 x magnification with scale bars represent 100 μm. 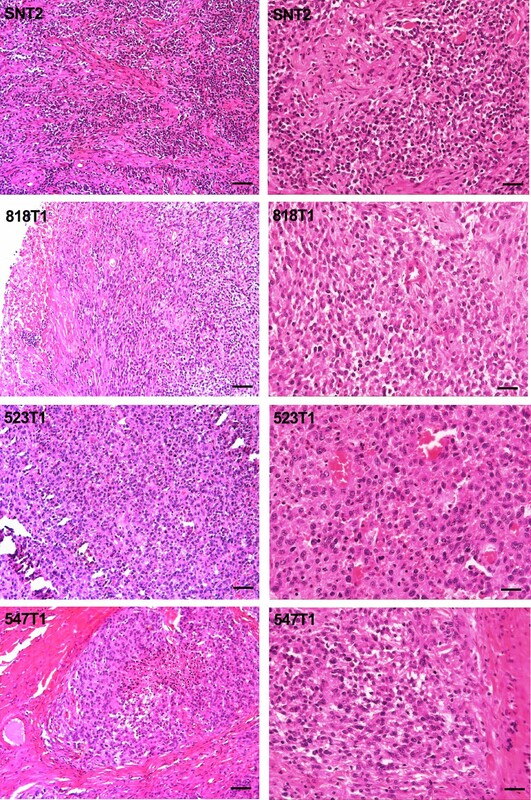 DFT2 tumours have different growth patterns. 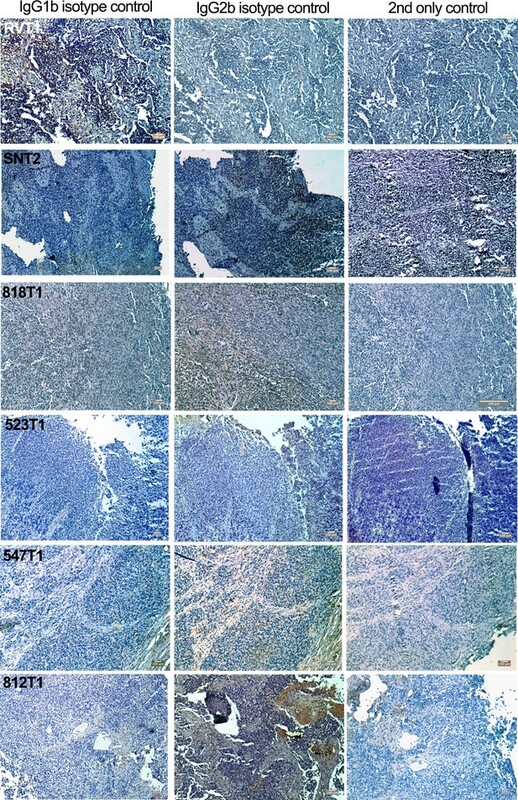 H and E staining of four DFT2 tumours representing different growth patterns. Scale bars represent 100 μm. CD3 staining of DFT2 tumours. CD3 staining of DFT2_RVT1, DFT2_SNT2 DFT2_818T1, DFT2_TD547T1, DFT2_523T2 and DFT2_812 tumours. CD3 positive cells are indicated by arrows. DFT2_SNT2, and DFT2_547 are CD3 negative. Scale bars represent 50 μm. Positive cells for each marker are stained brown, nuclei are stained blue. DFT2 shares classical MHC class I alleles with its hosts. Alignment of the MHC class I sequences cloned from the mRNA from DFT2 cell lines (DFT2_CL) and host devils (TD_RV, TD_SN and TD_818 (Teu)). Nucleotide alignment in (A) and amino acid alignment in (B). Red asterisks indicate residues postulated to interact with peptides and blue asterisks indicate residues predicted to interact with TCRs (Bjorkman et al., 1987). Chromatograms of α2-domian of MHC class I from spleen samples from RV, SN and 818/Teu. 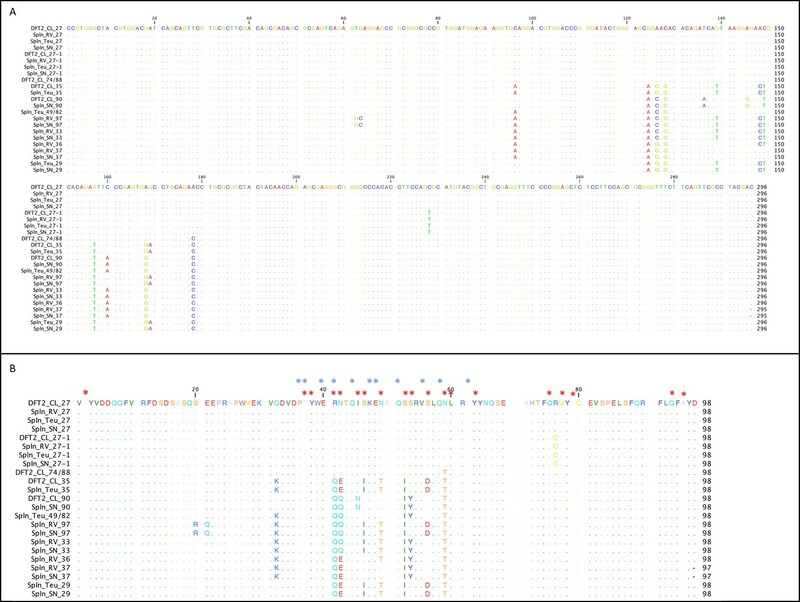 Spln_RV, Spln_SN and Spln_818/Teu host tissues share the same polymorphic sites in the MHC class I α2-domian. 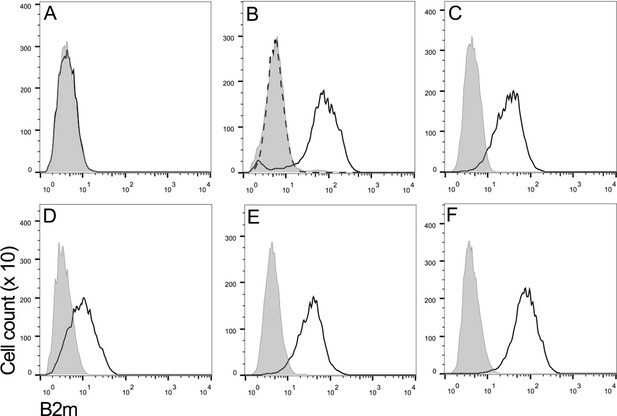 Chromatograms of α2-domian of MHC class I (Saha-UA, -UB and –UC) from spleen samples from RV, SN and 818/Teu from PCR amplification and sequencing using the reverse primer Saha91. Polymorphic sites are indicated by an asterisk. MHC class I alleles expressed by DFT2 cell lines and host animals. The classical and non-classical MHC class I alleles expressed by DFT1, DFT2, TD_RV, TD_818 and TD_SN. Grey boxes indicate the alleles identified in each sample. Numbers in the boxes indicate the number of clones identified for each allele. SahaI*32(UD) and SahaI*UK were amplified with gene specific primers. MHC class I transcripts expressed in DFT2 and host devils that were used to generate Table 1 and Figure 5. All data generated or analysed during this study are included in the manuscript and supporting files. Source data files have been provided for Table 1, Figure 5 and Figure 3-figure supplement 1. Publicly available at the European Nucleotide Archive (accession no: GCA_000189315.1). Publicly available at the European Nucleotide Archive (accession no: ENA: PRJEB21902). Biological samples used in this study. Details of the tumour and host tissue samples, the date the samples were collected from the animal and the location of the animal when it was trapped. *As described previously (Pye et al., 2016b). Primers used in this study with amplicon size and optimised annealing temperature. PCR conditions for the primers used in this study.